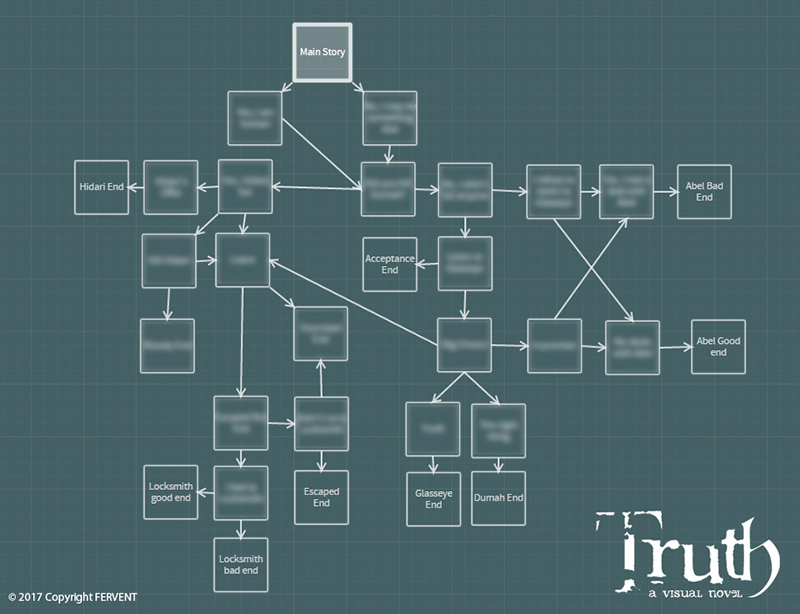 Starting this week, we’ll be updating everyone on the status of the Truth’s gamedev every Wednesday or Thursday, so I hope you monitor our progress as we go through the development. The updates are not going to be too flashy in these early stages, sorry! The writing and shaping of the story comes first right now. I’d have to say this step is crucial whenever you’re making a game, especially for beginners (like me ;v;). Owing to the halted progress of my last project (TBH), I have learned from my mistakes and will NEVER announce a project unless the story structure is at least almost done. It’s easy to get excited by an awesome idea or gameplay mechanic, but take a while to plot the story out before thinking too far. It will increase the chances of the game actually getting finished, instead of becoming another sad, once brilliant idea gathering dust in the corner; just like that spelling trophy you won in first grade. The choice system is not going to be that complicated. I’m thinking that you will be able to control your choices so you can get the endings you want. It won’t be like Cupid where the player needs to rely on context clues, with absolutely no idea what you’re getting as an ending. In Truth, it’ll be more cut and dry; more obvious that you’re going along one path instead of another, along with some choice triggers that would steer the story abruptly to another path. Hopefully, it’s challenging enough. I’m aware that some people are more interested in just reading the story though, so I’m toying with the idea of putting a “Hints” feature in the game. There is another issue of in-game perks. I’m planning that you can collect certain bits of info about the characters as you go on. This will not affect the story at all, but serve as backstory accessed in the extras. This one probably requires a separate gameplay, like a mini-game… But I’m not too sure about it yet. Maybe it’ll be a separate choice system instead, so it won’t interfere with the story. 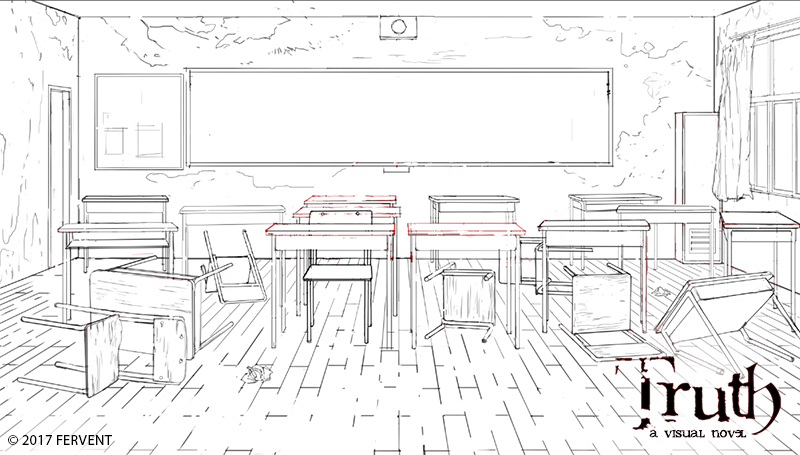 As for the art, the main background sketch is done. Haunted School Buildings ftw! Kinda reminds me of Corpse Party now that I think about it, lol! This entry was posted in Projects, Truth, Updates and tagged art, demons, evn, fervent, fiction, gamedev, games, indie games, interactive story, oelvn, renpy, supernatural, truth-vn, visual novel, visual novels. Bookmark the permalink.